It’s been a little over a week since we’ve had our new adventure vehicles. We’ve been riding almost every day, although with the steep terrain around here, our rides haven’t been exceptionally long. Yesterday we decided to step up our game a bit, and make our way into town. Our destination was Corona, CA, approximately 10 miles away from our daughter’s home. As we navigated the main road between the two destinations, with cars and trucks speeding past us, sometimes only inches away, I came upon a couple of epiphanies. Where did all this traffic come from? We have driven the road into Corona more than a dozen times, but even though I took note that there was a bit of traffic on that road, I never fully grasped just how busy the road was. There were cars buzzing by us almost the entire way. The wide dirt shoulder that existed at portions of the road were greatly appreciated, giving us a welcome safety buffer, but when the shoulder disappeared, most often on sharp corners, the passing traffic became significantly less comfortable. Do automobile drivers notice this kind of traffic? When traffic stops because of an accident or construction, or on extremely congested highways, I’m sure they do notice it. On normally busy roads though, when the cars are all moving at the same speed, I don’t think they do. Or at least, I certainly didn’t. Heading into town, downhill. Note the jacket: It was cool! Who put these hills here? The other thing that I had failed to note while driving on this road was the length of the hills, and their grade. Or for that matter, the existence of hills altogether! Certainly, when driving up or down steep mountains in a car, the elevation change becomes apparent. 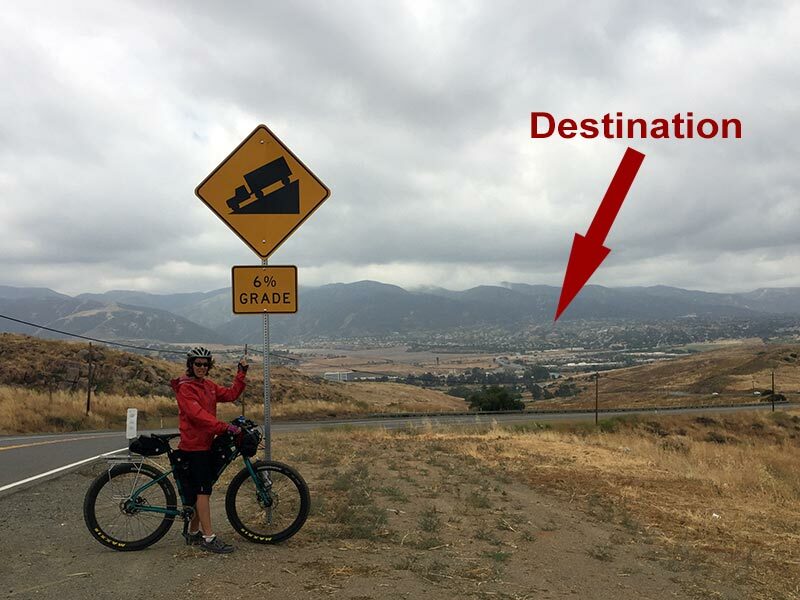 Less steep grades more often go unnoticed though, but on a bike, they certainly don’t! As it turned out, the 9-10 miles that we rode into town was almost entirely downhill, and so it passed by without too much effort, and relatively quickly. The return trip home was another matter. I’m happy to report though that even with the long hills, we managed to complete the entire return trip with only a couple of stops totaling no more than 60 seconds, and those stops were not because of fatigue, but rather to wipe the sweat out of our eyes. All in all, it was a good ride, but neither of us are too eager to tackle that busy road again. The trails and side roads are much more fun! The cycling idea, where did it come from? Previous PostWater: where to carry it all? I’m with you on the traffic. I bet Alaska is so much quieter and will seem fantastic by contrast. Like California, here in NY traffic is intense. Lots of ramifications I don’t like. Lately I have been hiking into the woods in search of peace and quiet. That said – today I am driving 2 hours through the worst NYC traffic to Long Island to go sailing for a couple of days on my buddy’s 36 foot Contest. Hey, it beats working! That sounds like fun (the sailing on your friend’s boat, not the driving). That’s a great road and a lovely area (at least by Inland Empire standards, which are admittedly quite low). But I’m impressed that you braved it on your bikes, what with the high traffic (at times) and daredevil corner-seekers (at others). California recently passed a law that requires cars to give cyclists at least 3′ of room while passing. Arguably a step forward, but I’m sure 3′ feels way too close when cars are moving at 50+mph. On the road where our daughter lives, drivers have been exceptionally polite, most times moving into the entire opposite lane. On this road though, drivers were not always so courteous. The worst offender was a school bus who definitely passed much less than 3′ from us. 1. Purchase and use a rear view mirror — you can obtain a small one that actually attaches to your glasses/sunglasses. Doing so will let you know when that big ‘ole school bus is coming up behind you (or here in Texas, pickup trucks with the huge door mirrors that seem to come awfully close to my shoulder!). Knowing someone is coming allows you to prepare for it’s passing and won’t startle you when it does. 2. Acquire and use a bright, blinking rear facing red light. Either attach it to your bike, or in your case since you plan to carry numerous bags, attach it to the back of your helmet. Just make sure it can be well seen from behind you. Doing so will allow drivers to better see you from a distance as they quickly approach you. There are numerous small, powerful alert lights on the market. I’m looking forward to reading about your future riding adventures! Be safe and keep the rubber side down!! Hi Duane. Thanks for speaking up. The mirror is on our list, even just to keep tabs on one another without cranking our heads around. The light makes sense too. Even though we plan to limit our riding to daylight hours, there’s always the chance that we’ll get caught out. I use red and white STIX lights all of the time. All of the time I am riding only in the daylight. I figure that just like daylight running lights on cars the use of flashing strobes on your bike can only help make you stand out a bit more to drivers. As a driver in a large city I find that the bikes without lights just blend into the background that is whizzing by me. The STIX are USB chargeable so they will be another electronics that you will need to charge. I find that they last 8 hours easily. Finding an A/C outlet at lunch and coffee / water / rest breaks would let you top them up. They do recharge quickly. More reason to stay away from traffic. Those “invisible” hills sure make a difference. I found that out myself when what I always thought of a flat car trip turned into a 6 mile uphill in the heat on a bicycle. Having lived in a rural area for seven years between boats — and doing daily walks and bike rides on the shoulders of those roads — we learned that we HAD to make ourselves visible. It was amazing how much more room vehicles gave us when we started wearing bright t-shirts over whatever else we were wearing. We found that the best were the OSHA yellow, green and orange ones made for road construction workers (you can get them on Amazon and at Walmart) — the ones with the reflective stripes were even better. Discovered that the same thing was true when SUP-ing and dinghying in crowded places! I don’t doubt you, but find it hard to imagine that a couple of cyclists on a wide open road would go unnoticed.